Sylvester Stallone as Lieutenant Marion “Cobra” Cobretti wears Ray-Ban 3030 Outdoorsman sunglasses with black frame and green lenses in the 1986 American action movie Cobra. 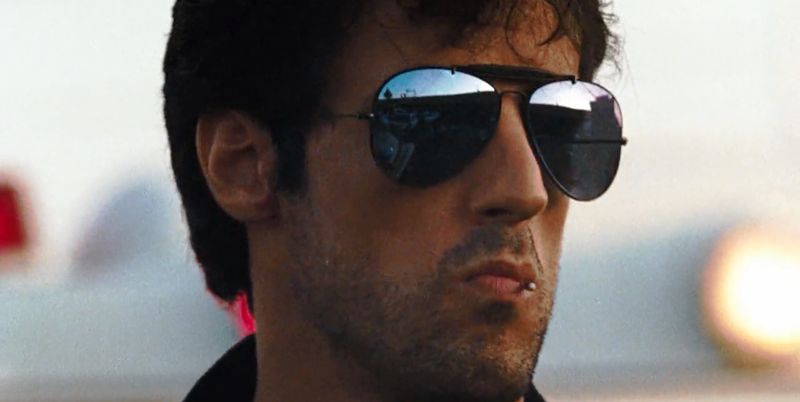 If you’re a fan of aviator sunglasses, make sure you check out these shades worn by Sylvester Stallone in Cobra. A classic design that has never gone out of style, they will make anyone look stunningly good when the right size is selected. Let’s take a closer look at what Ray-Ban’s RB3030 Outdoorsman sunglasses, 58 mm, Non-Polarized model has to offer. Once you put these sunglasses on, they are not sliding off. These are, of course, the very same style of sunglasses that Sylvester Stallone once wore in Cobra – and if you’re wondering why his shades wasn’t flying off his face every time he did a stunt, it’s due to the adjustable hooked ear pieces. These babies are definitely staying put, no matter what the activity. The shades offer 100% protection from harmful ultraviolet (UV) rays. Whether you are just driving around in your car, playing eighteen holes of golf with you friends, or tracking down a gang of sociopaths like Cobretti, your optical health will be safe and secure. These sunglasses are made of a lightweight composite material. This means that they are not going to be heavy on your face or, cause you to sweat incessantly like some of the cheaply made plastic sunglasses do. On top of how these sunglasses will make anyone look oh-so-good, purchasing the shades will also entitle you to receive an awesome snap front case. This comes in very handy for those moments when you just can’t justify keeping them on. For example: when having dinner with your mother-in-law, or while having a video conference with your boss. You’ll have a place to keep them from sticky fingers and accidental mishaps. Pretty much every review about these shades mentions the same word: classic. And that’s because that’s what they are. Really, what’s more classic than Sylvester Stallone’s look in Cobra. Aviator glasses have been popular since the 1960s. If you buy a pair of aviator glasses, the chances are pretty good that they won’t ever go out of style anytime soon. And let’s face it: they are practical, versatile, and of course… they make you look really cool.